In plain language PATH means an assessment and treatment recommendation that takes into account what’s going on with us as a whole person, rather than our specific parts. A worthy goal for all of us, but with particular importance for those both elderly and frail, and who may have a dollop or more of confusion. Dr. Laurie Mallery, head of the Division of Geriatric Medicine at Dalhousie University and Director of the Centre for Health Care of the Elderly at the QEII Health Sciences Centre in Halifax, Nova Scotia. and Dr Paige Moorhouse with her Masters in Public Health, also practicing at the QEII, are like-minded in their concerns for care of the frail elderly. 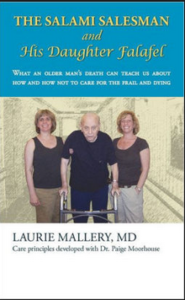 “We spent many years, looking at all factors related to the frail elderly. “The frail elderly are often in and out and in and out of healthcare with many crises, assessed by many people – each of whom brings their own lens. There’s no organizational plan to take this info and use it collectively and understand the significance, for example: is this person near end of life, and should we take that into account in discussing a medical procedure. Sometimes the patient seems frail but they really have a hearing impairment. People don’t have enough information to make an informed decision about end of life treatment. There is often an over-enthusiasm for procedures, even if the patient can’t walk, and is doing poorly to begin with. Bill Keller, former New York Times editor, writes in an op-ed column: when his wife told her father, “Yes, you’re dying” her father’s response: ‘“so, no more whoop-de-doo.” As Keller says, they could have maintained his failing kidneys by putting him on dialysis. They could have continued pumping insulin to control his diabetes. He wore a pacemaker that kept his heart beating regardless of what else was happening to him, so with aggressive treatment they could — and many hospitals would — have sustained a kind of life for a while. At life’s end, there isn’t the need to tightly control blood sugar or blood pressure. We can reduce the burden of medications. Dr Mallery wrote of her experiences with her dad when he was frail and elderly and suffering from dementia in The Salami Salesman and his daughter Falafal. She shares with me a scenario that’s uncomfortably familiar.